Use one of these methods to get rid of that gross, filmy layer coating your tub, shower, and tile, then try out our tips for eliminating it forever! If you bathe your body at all, you’ll inevitably encounter soap scum. It’s a sad irony of housekeeping that a substance that gets you clean every day can make your shower or tub so grungy. While that stubborn, scaly buildup forms when the fatty acids, talc, and other ingredients in bar soap react with the minerals in hard water, soap scum also contains body oil, dirt, bits of dead skin, and bacteria. Gross. Making the situation even less appealing: if soap scum is left to harden, it’s incredibly difficult to remove from your tub or shower. But fear not! There are many successful methods for removing soap scum. Read on to find the approach that’s right for you. Some popular commercial cleaning products have cracked the code on soap scum. We like Scrubbing Bubbles for its effectiveness and ease of use—and its ready availability. You can buy it on Amazon or at your local grocery store. If such products appeal to you, the process is straightforward: Spray your tub and shower walls with the product, and give it a few minutes to cut through the greasy grime of the soap scum. Then, rinse and wipe down the surfaces with a sponge, scrub brush, or cloth. Follow up with a clean towel to get everything dry—remember, moisture attracts yucky buildup. If DIY cleaners are more to your liking, here are a couple of recipes you can try. • Baking soda and vinegar. Pour a cup of baking soda into a small bowl and add enough white vinegar to make a paste. Once the mixture stops fizzing, use a sponge to apply it to your shower and tub, then let it set for about 15 minutes. Wipe the surfaces down with a non-scratch sponge, rinse thoroughly with water, and then dry. • Vinegar and dish detergent. Combine equal amounts of vinegar and water into a spray bottle, then add one tablespoon of dish detergent. Spray the solution on the soap scum, and allow it to sit for about 15 minutes. When you return, scrub it with a soft-bristle scrub brush, and rinse with hot water. Dry thoroughly. If you have a porcelain tub, you can use a wet pumice stone to remove soap scum—so long as you work carefully. Improper technique or a dry stone can scratch glass doors or tile. To give it a try, wet both the pumice stone and the surface you’re working on. Then, very gently rub the wet stone over the soap scum. As the soap scum transfers to the pumice stone, use a stiff-bristle brush to clean it off, then go at it again. Alternatively, on a surface with very bad soap scum, you can try scraping it off with a razor. But avoid using any abrasive technique on a fiberglass or acrylic tub or shower. As in most activities, an ounce of prevention is worth a pound of cure. 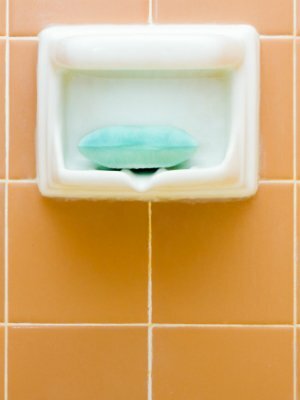 These top tips can help you manage buildup by preventing soap scum from forming in the first place. Use liquid soap instead of bar soap. It’s the talc and fatty acids in bar soap that cause soap scum, so if you switch to liquid soap or shower gel, you should see a significant decrease in filmy residue. Keep your shower and tub dry. 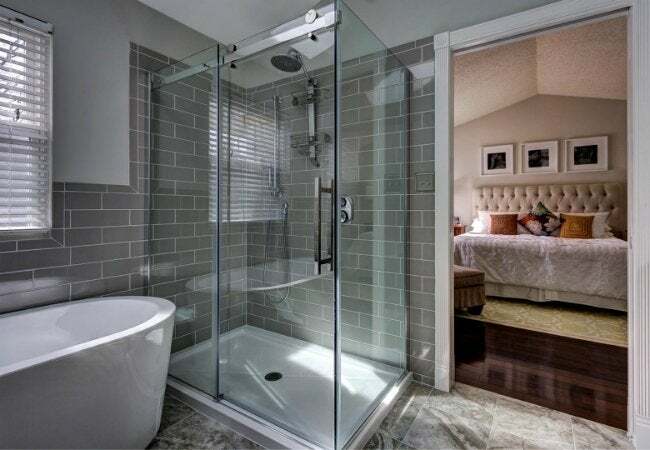 Squeegee and/or towel dry your shower and tub after every use. You’ll be wiping away a good portion of the soap scum-creating particles left behind after you bathe, so you won’t experience the same level of buildup. Soften your water. Soap scum thrives on hard water, so one way of thwarting it is to install a water softener, which will remove those minerals in your water that react with soap to make soap scum. If you’re not up for purchasing a water softener, consider adding Epsom salts to your bathwater to help soften it and keep soap scum under control. As a bonus, the Epsom salts will also soothe your sore muscles. 4. Use a daily shower cleaning product, or invest in an automatic cleaner. We live in a beautiful world where automatic shower cleaners exist. If you use one, you’ll notice a big reduction in soap scum, and you’ll be relieved of the arduous chore of removing it.